"Mathematics . . . is merely the etherealization of common sense." Although Thomson was born in Belfast, Ireland, his mother was from Glasgow and his paternal ancestors were Presbyterians who had been forced out of Ayrshire in the 1640s during the struggle between Charles I and the Covenanters. The family returned to Glasgow in 1833 when James Thomson, William's father, received an appointment as a mathematics professor at the University of Glasgow. William entered the University at age ten, and headed to Cambridge at seventeen, where the study of mathematics, physics, and electricity captured his intellectual curiosity. 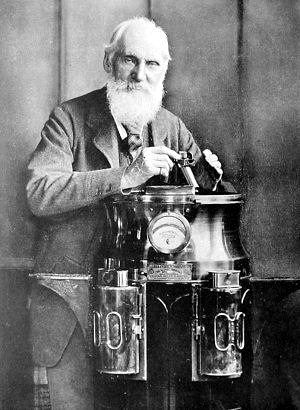 At the young age of twenty-two, Thomson was appointed to the Chair of Natural Philosophy at the University of Glasgow, where he began work on thermodynamics. In 1848, he proposed an absolute scale of temperature based on his studies on the theory of heat, which later became known as the Kelvin scale. 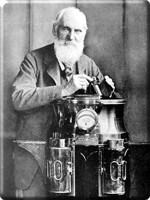 Four years later, Thomson was working with British scientist James Prescott Joule, and the two men observed that the temperature of gas decreases when it expands in a vacuum. This observation, known as the Joule-Thomson effect, laid the groundwork for a dynamic theory of heat. In 1856, Thomson published his observations regarding the dynamical theory of electricity and magnetism. He discovered that electricity in motion was heat -- and a certain alignment of axes of revolution in this motion created magnetism. Although by the 1850s Thomson was preeminent among academics, he was obscure to the public. He gained mainstream recognition for his work when he was appointed to the board of directors for the Atlantic Telegraph Company, which wanted to lay a transatlantic submarine cable between Ireland and Newfoundland. Thomson's successful design was laid in 1865. 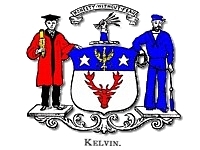 For his work on this project he was knighted in 1866, and in 1892 was elected to the peerage with the title "Baron Kelvin of Largs;" Kelvin for the name of a river that ran near the University of Glasgow, and Largs for the place of Thomson's residence. 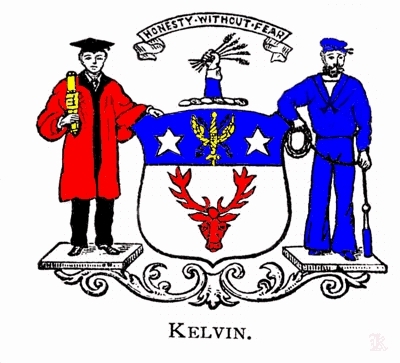 Lord Kelvin's work was highly influential to James Clerk Maxwell, another giant of early physics.